Photos courtesy of GCP&T Children can visit Mr. Claus at GCP&T’s Santa’s Holiday in the Park, Wednesday, Dec. 5 through Saturday, Dec. 8 at James Ranch Park. XENIA — Greene County Parks & Trails’ Santa’s Holiday in the Park returns 6-9 p.m. Wednesday, Dec. 5 through Saturday, Dec. 8 at James Ranch Park 177 Fairground Road. Event attendees can park at the Fairgrounds Recreation Center, 210 Fairground Road. New features this year include a life-sized holiday snow globe which will allow patrons to enter and become part of the winter scene. A photographer will take photos and provide a print for free to each family. Mr. and Mrs. Santa Claus will greet families within the 1800s brick home at James Ranch Park. Photographs will be available from betterImages with packages starting at $5 for a 5-by-7 print. Photos will be mailed to patrons within 24 hours of ordering. Families may also take their own photographs or videos. Within the historic home, children can write letters to Santa. The elves from Greene Memorial Hospital/Soin Medical Center will help mail the letters. Temporary holiday tattoos will also be offered. Park patrons are invited to walk James Ranch Park which will feature thousands of LED lights and more than 50 animated lighted displays placed throughout the park. Activity and hospitality stations will be scattered throughout James Ranch Park and feature holiday favorites including ornament-making with wooden ‘cookies’ created from GCP&T ash trees and pine cones, handmade candles, reindeer food, costumed characters, wooden cut-outs for photographs, and hot chocolate and kettle corn for sale. Greene Memorial Hospital/Soin Medical Center and betterImages are sponsoring the event. Donations of $1 per person are encouraged with all funds raised invested back into the event for future years. For more information, contact GCP&T at 937-562-6440, visit www.gcparkstrails.com or email info@gcparkstrails.com. 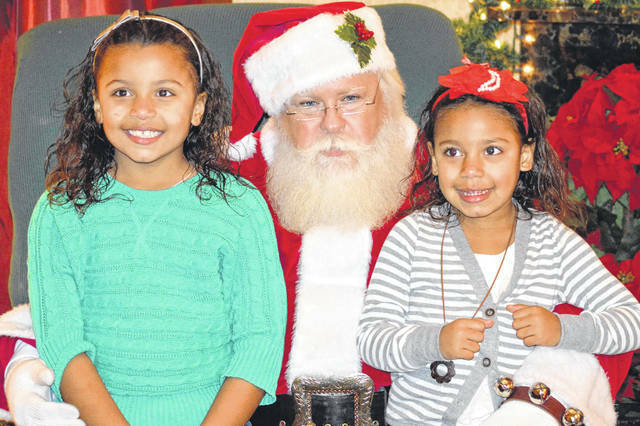 https://www.xeniagazette.com/wp-content/uploads/sites/32/2018/11/web1_SantaHoliday.jpgPhotos courtesy of GCP&T Children can visit Mr. Claus at GCP&T’s Santa’s Holiday in the Park, Wednesday, Dec. 5 through Saturday, Dec. 8 at James Ranch Park.